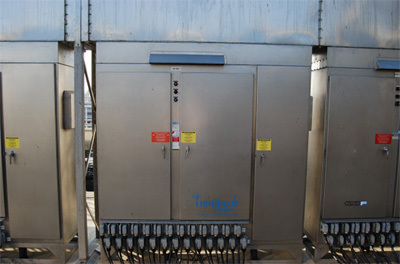 Ironbrook Partners manufacturers the Fisher & Porter Design of Ultraviolet Disinfection System which has been constantly upgraded to the latest level of technology. 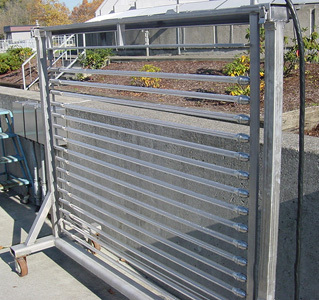 So whether you are an existing customer looking at new flows or changing permit limits we can help your system expand or a new site with unique flow characteristics and are looking at Ultraviolet Disinfection as a disinfection solution, Ironbrook Partners can provide you with the most cost effective field proven Ultraviolet Disinfection in the marketplace. Our UV systems have been working for over 25 years and continue to work. With many of our systems treating hundreds of millions of gallons per day, we know that we can provide a solution for your plant. Please look at the "advantage of our low pressure system" to see for yourself why you should select Ironbrook Partners as your supplier of an Ultraviolet Disinfection System. We provide original OEM parts for the Fisher & Porter Ultraviolet Disinfection Systems which are backed up by US EPA approved Bioassays and hydraulic data to ensure you that you are buying quality products that enable you to meet your disinfection and dosage requirements. No UV system become obsolete with Ironbrook Partners, we strive to ensure that your UV system will continue to have parts for the next twenty years. Ironbrook Partners provides onsite service to its customers to fix existing systems to bring them up to today's technological standards. We accomplish this by providing only US EPA approved ballasts and American made lamps both backed by Bioassays. We have the experience and expertise with the Fisher & Porter Design to assist you with onsite training. As well we repair old ballasts, boards and lamp racks in our shop. In fact you can send your entire UV system back and we will send it back to your completely refurbished in a matter or weeks with new transformers, pin-outs or any other component that requires maintenance. The system will be completely factory tested and returned to your site and reinstalled. Energy Efficiency Ironbrook Partners offers our customers a low pressure Ultraviolet Disinfection Solution. This is the most cost effective solution in the marketplace given that our lamp produces 41-43% UV output at 254nm as documented by US EPA approved third party testing done at Lehigh University. Whereas medium pressure lamps produce only 9-11% UV output and low-hi produces 31-33% UV output. It should be carefully noted that their dim-able lamps actually still draw the same wattage whether their ballast is driving the lamp at 60% or 100%. The lamp does get less power but the ballast power factor drops and produces a lot of waste heat. So when looking at power output data make sure that the customer looks at the lamp/ballast combination and that third party validation for said combination is provided as otherwise it is just fancy marketing again. Having a system that can dim a lamp 60% is useless if 40% more heat is given off the ballast. No Algae Growth Promotion The issue with these other technologies is that their broader spectral range includes wavelengths that promote the growth of algae. Visit any site with their technology and see how everything is covered green with algae. No Scale Formation Our lamp also runs very cool, at 90 degrees Fahrenheit opposed to close to 1100 degrees for the medium pressure lamp and 200 for the low-hi lamps. What results with their technology is they act like a heat exchanger, depositing scale on the lamps whereas our lamps do not promote scale growth. Off the Shelf Lamps The cost of re-lamping an Ironbrook Partners Ultraviolet Disinfection System is the least expensive in the industry. Buying fewer extremely expensive lamps do not save the customer money, furthermore in some instances their lamps need to be installed in a complicated harness with ceramic disks to keep the lamp from melting the quartz sleeve. Higher Quality Quartz Ironbrook only used top quality type 214 quartz with 89- 90% transmittance. With their technology and need for continuous cleaning because of algae and scale a lower quality of quartz is being used with only 80% transmittance. Their cleaning system destroys the higher quality quartz. So immediately with our solution the customer is getting 10% more UV light into the effluent where they are adding another 10% of their output to the broader spectral range as waste heat and algae promoting wavelengths. Lower Electrical Costs Given our high energy efficient lamp and 97% power factor ballast our annual electrical costs will be the least expensive in the industry. Energy cost is the single most important annual cost for running an Ultraviolet Disinfection System. Furthermore for the contractor given their energy usage will be 25-400% higher so will all the electrical switchgear and lines. Our solution has the lowest electrical installation cost. Our Lamps are typically cleaned once per month in a cleaning basin as is the requirement for chemical cleaning with other technologies. Effluents contain impurities such as iron which chemically bond to quartz and cannot be scrubbed off with continuous cleaning systems. The requirement for continuous cleaning is a requirement of their lamp technology which promotes algae growth and scale, not ours. We have 355 Ultraviolet Disinfection Systems worldwide which does not require automatic cleaning systems furthermore other UV companies installed thousands of low pressure UV systems worldwide without the need for self cleaning systems in the 80s and 90s. The quality of effluent did not change rather marketing did. Low pressure UV systems do not need self cleaning systems. Our typical 8-lamp rack weighs only 44 Ibs and can be easily lifted into a portable cleaning basin without the requirement of a Jib crane, whereas they need a crane to life their delicate lamp rack with hydraulic lines and motors. In larger applications we but the entire bank of lamps into an integrated bank assembly; so that the entire bank can be lifted as one piece into a cleaning basin. Again, cleaning only takes 30 minutes for the entire bank to be cleaned; so entire systems are cleaned in hours. We have no moving parts underwater, no alignment issues, and no algae promotion. Rather we offer a solution that works and has worked for 27 years and continues to work. Visit any site with a self cleaning system over 5 years old and see for yourself the results of their failed cleaning system. Broken lamps, sleeves and blown ballasts from a cleaning system that has torn itself apart. With their technology and algae promotion cleaning now because a constant issue for the site. Often daily hand cleaning of the lamps is required of their cumbersome lamp racks. Noting they dont seem to be offering any extended warranties of their cleaning system do they. If they were confident of their technology why wouldnt they guarantee their self cleaning system for the life of the system (20 years). Reputation We are not touting our reputation but rather that of our lamp. The G64T5L has been in production for over four decades. It is used as the standard off the shelf lamp in thousands of Ultraviolet Disinfection Systems around the world. Ironbrook has systems with 11,520 lamps treating 265 MUSGPD, 5280 lamp Title 22 site in California along with many other sites ranging down to 4 lamps and treating 100,000 USGPD. Rather then buy a high priced, low efficiency; algae promoting lamp buy the one that everybody uses that has been field tested longer then most of us have been alive. Ironbrook Partners Solution What we offer is a continuation of the 27 years of field proven results with our Ultraviolet Disinfection Sites. We have worked with our American Lamp Manufacturer to make the lamp better by improving the lamps thermodynamics ensuring no cold spots and reducing the migration of the mercury out the lamp into its quartz case. What this means is not only are you getting the best technology, but that the technology itself has gotten better.